In this post are four videos related to Rolfe, Iowa, girls’ 6-on-6 basketball. One of the videos is from a game played on February 11, 1972. 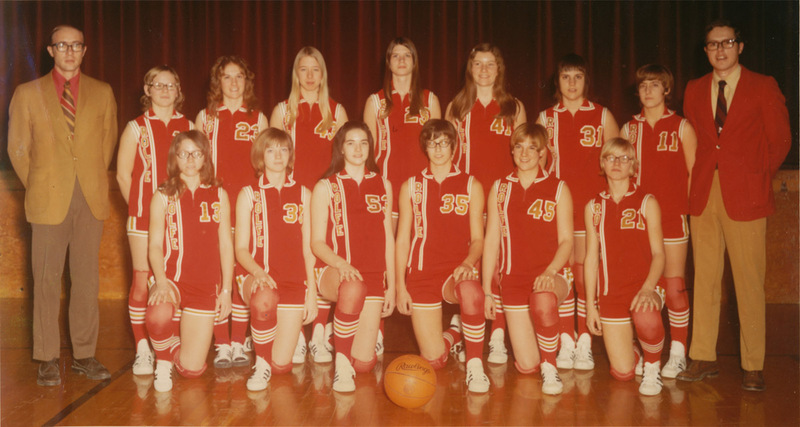 In this video the Rolfe girls’ 1971-72 basketball team is playing rival Manson at Rolfe. Rolfe won the game, which was the last game of the regular season, by a score of 84-72. With this victory the Rolfe girls secured, outright, the championship of the Twin Lakes Conference. Rolfe’s conference record that ’71-’72 season was 14-0. Manson’s was 12-2 with their only conference losses being to Rolfe. That 1971-72 conference championship followed the 1970-71 season (the previous season) when the Rolfe girls defeated Manson in the district finals, earning for Rolfe a trip to the 1971 girls’ state tournament. During the 1971-72 post-season, the opposite happened when Manson defeated Rolfe in the district finals. While that was heartbreaking, to this day when I think of that 1971-72 season, the first thing, and only thing I remember vividly, is what happened after sitting in the bleachers in the Fort Dodge gym watching the game prior to ours. At about the end of the third quarter of that game, in unison our team and managers stood, walked down the bleachers, and along the end of the gym to dress for our game against Manson. We wore our red dresses, which we had made (sewn…which…how many teams do that today?!). What made that moment in time so spine-tingling and memorable was that three-fourths of the spectators stood, clapped and cheered for us as we were on our way to dress. It wasn’t just “sort of like” or that we imagined or embellished that three-fourths stood and cheered. Nope. Except for the Manson crowd, which was clearly delineated and clearly one-fourth of the spectators, the crowd, including those from the three other districts playing that night, honored us as we walked down those bleacher steps and exited the gym. There’s no sound, and you see only the Rolfe spectators and a few of the Manson spectators, but use your imagination as you watch the last clip in this post. The first three clips are of tournament games leading to the district finals. This next clip is of that thrilling (very thrilling) walk to the locker room (mentioned above) with three-fourths of the spectators cheering us on. Thanks to the supporters, teammates and coaches, I have an emotional high every time I think about it. Click here for a listing of other posts regarding Rolfe girls’ basketball. Several of the posts include videos, as well as photos. I’m anxious to get this posted. If you are wondering who is whom in any of the videos, let me know or reference the photo at the top of this post. mariongundersonart@gmail.com I’ll probably add some identifiers within the next week or so. This entry was posted on June 7, 2011 at 8:33 pm and is filed under Girls' basketball, Iowa, Rolfe. You can follow any responses to this entry through the RSS 2.0 feed. You can skip to the end and leave a response. Pinging is currently not allowed. Thanks for posting these, Louise. I got to see a little glimpse of my Dad in one of the videos and boy does that bring such joy but tears too. What great memories. Joyce: I should have told you earlier about the glimpse of your dad in one of the videos. To give you a heads up. I know I had seen the video a few years ago, but this year when I really closely watched the videos over and over, I re-noticed about your dad being in it. Every time I saw your dad I was so pleased (mostly for you but also for all of us) that he was on that clip, even if for just that short moment. I think I told you that on April 16th someone from the audience yelled, “Be there.” A tribute to your dad being so supportive with such a big heart. I know you miss your dad. He was/is (in spirit) such a fun, supportive guy well-deserving to be missed by you and the rest of your teammates.